The vision for a Science and STEM Lab at Decatur Adventist Junior Academy has come to life! Thank you to everyone that has donated their time, money and volunteered their physical labor to bring this dream to life. The Lord be praised!! From DNA experiments, school supplies and a bounce house for the kids, to voter registration for the parents, we made it work inspite of the rain! Another #Compassion100K event complete! The "Tee Up Fore Kids" Education Golf Classic was a fundraiser hosted by the Friends of DAJA foundation to benefit the students of DAJA and the members of the DeKalb County community. Our goal is to raise $75,000!  Members of Decatur church and our sister churches came together to donate our time, talents, and treasure toward a future homebuyer in DeKalb county! Communion: Our children's department planned an amazing program that taught our children the beauty of communion in a fun and creative way! VBS: This year was Cave Quest! Come join us every Saturday at 11 am for divine worship! Our AYS department had a spiritual scavenger hunt activity during our Youth Day. What a creative, fun-filled, spiritual event. Building and solidifying relationships one activity at a time.